After much pleading by our six year old, we made the trek upstairs to dig our Halloween decorations out of the storage closet. The kids spent many happy hours playing with plastic spiders and assembling a mini skeleton. I was overjoyed that I was able to have our house decorations up in a little over an hour. 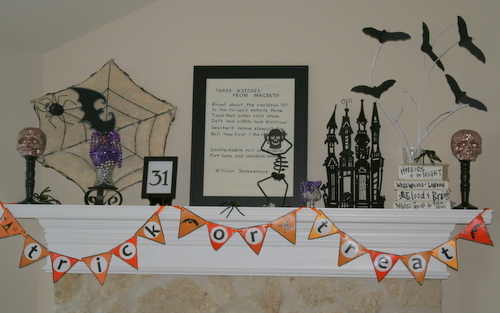 Today I will share with you three of the elements of the mantle – the bats & branches, the books, and the banner. Plus I have a printable, so keep reading. 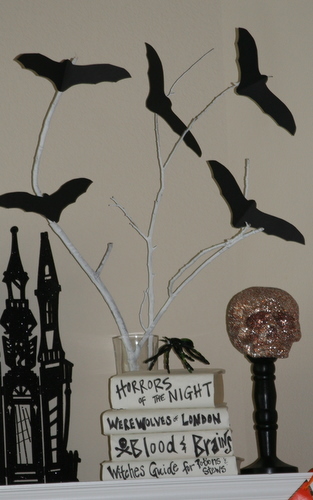 First up, the bats and branches. My challenge for the mantle each time I decorate it is to add height to the decorations. Our ceilings in this room are two stories tall so I try and have our display be on the same large scale. 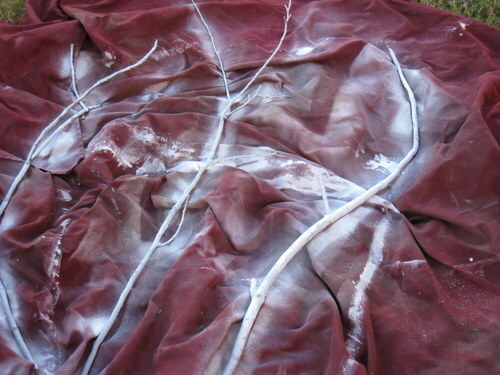 The spray painted branches were used in previous holiday mantles. During Christmas they held ornaments while during Valentine’s they held hearts. 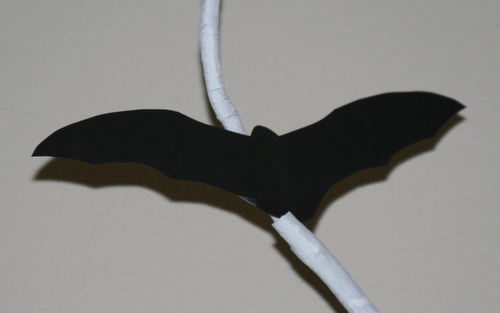 The bats were cut out of black construction paper last Halloween but were never used for a project so I thought they would be perfect taped to the trees. 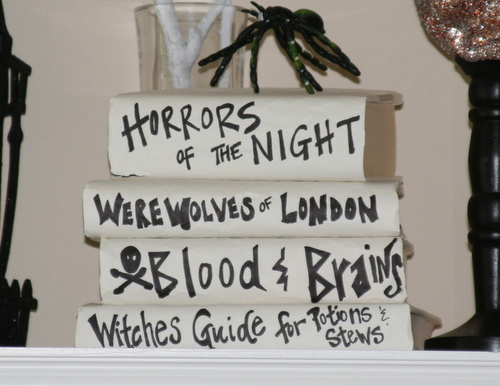 The spooky books are simply books covered in white paper and taped together. It was frightening how many gorey words my two oldest could come up with in when faced with the task of creating titles for these books. I insisted we tone it down for the display. 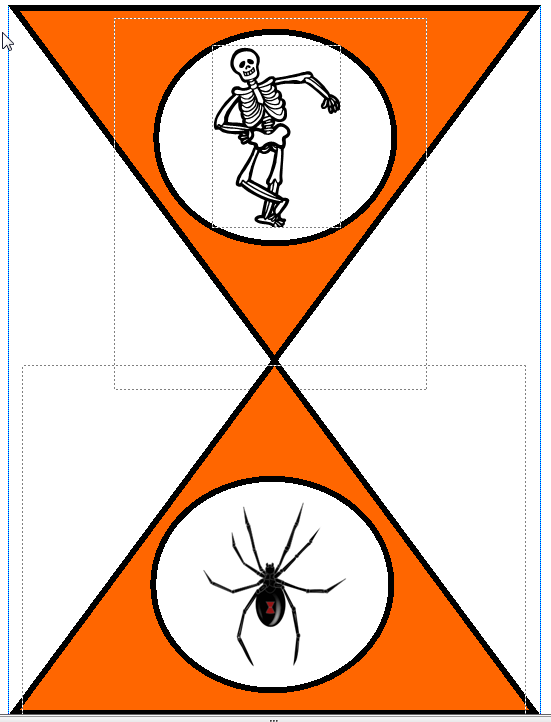 Last year I created the “Trick or Treat” banner by cutting out orange triangles, pasting white circles with letters on it, and adding stickers for the symbols. After I modge podged it, poked holes in it and strung it by a ribbon, it was finally completed. Frankly, tons of work. I wanted to create a printable for you and figured this would be easy to recreate. In fact, it was so easy, I’m going to create all my banners this way. 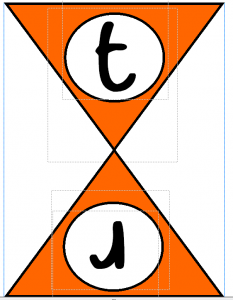 The printable I created for you consist of 12 separate Halloween symbol triangles and 8 separate triangles with letters which will spell out “trick or treat“. You will need to print out the letters t and r multiple times. 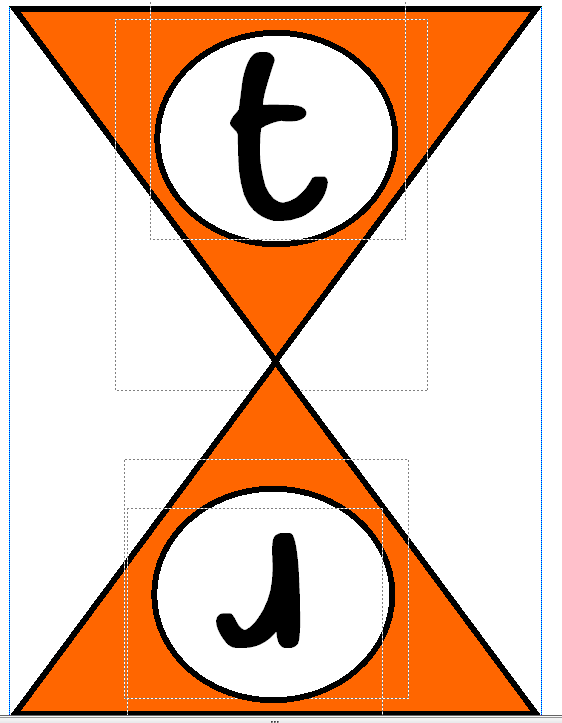 I printed out the symbols on card stock, cut holes on the sides, and attached with string. 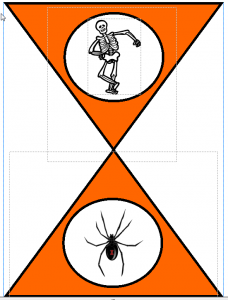 If you’d like the Trick or Treat banner printable please click here. Wednesday I will share with you how I made the large Macbeth sign and the glittered skulls. 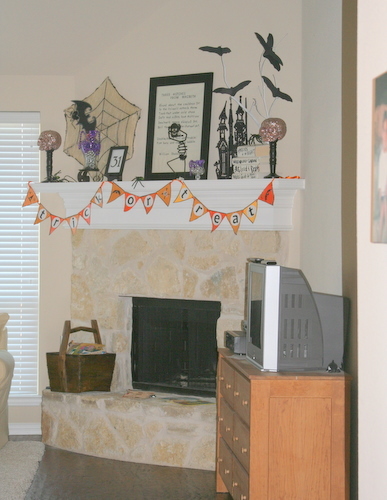 Do you have any favorite Halloween decorations in your home this year? This entry was posted in art work, bargains, budget, crafts, decorations, holiday, mantle. Bookmark the permalink. So cute, have the kids decided what they are going to be for Halloween? I love Halloween! And I love decorating for it. I don’t start until October. In Sept. 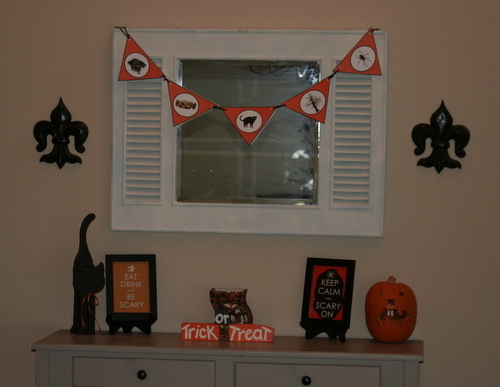 I start putting up fall decorations…and I am thinking of doing a banner like yours! Love it. Wow love the new decorations!!! and So simple! Stupid question but what do you print the triangles on? Paper? Some kind of card? Awesome! 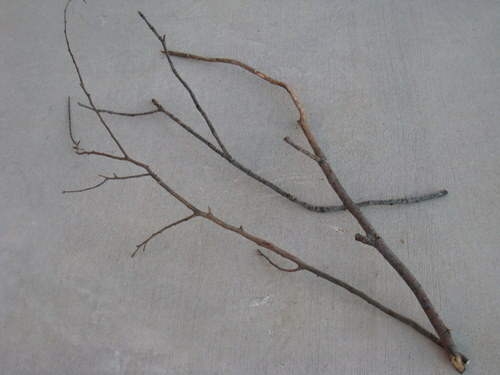 I love decorating with twigs, do you mind if I do these & link back to you?I’m stopping by from the Cure For the Common Monday Party & had to say hello!The whole mantle looks great! I would LOVE for you to link up to My Favorite Things Friday Party going on all week. Thanks so much & keep up the creativeness! Great stuff!! Newest follower from Polly want a crafter! Awesome decorations! I am starting to feel the need to pull mine out! Thanks for the inspiration and the printable! Love it. My favorite is the books..so simple and fun to do even in an “empty-nester” household..add a bit of fun! Your mantle looks so cute, great job! I love it! Thanks for the printable. What a cute idea! If you get a chance, I’d love you to link up! (http://scrapbookingez.blogspot.com/2011/09/everyone-wins-giveaway-linky-party.html.) Thanks for sharing this! I love the bats on the spray painted branches. I have some set aside to spray paint for Halloween, but I can’t decide between black or white! Or natural! Aaah, so many choices! You are a genius! What an adorable banner. Very cute! I love the way the orange pops against the black and white! In honor of my favorite holiday, I’m hosting a Halloween Link Party. Drop by if you dare! So fun! 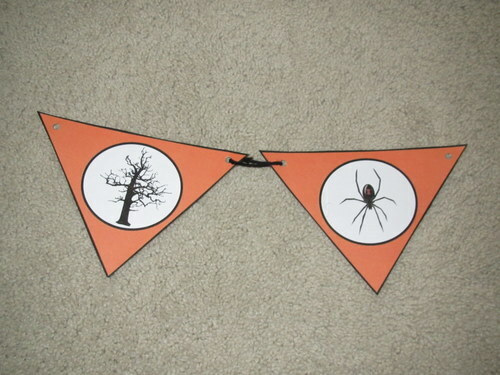 I need to start my Halloween decorating like NOW. Hi Me! Your mantle is so fun and has so many interesting elements! I saw your post over at “Serenity Now” and I am following you now. 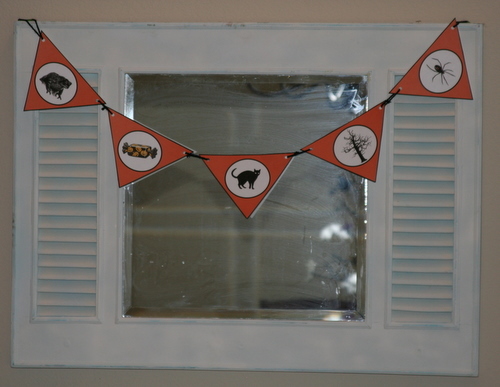 I did a post on some pennants (my first I have tried) this week. There were a little more time-consuming than I thought they would be…like you said. Thank you sooooo much!! I have printed mine out and can’t wait to put it together!! What a great project. I’d love if you would share this at my weekend Wonders bloghop. I think my UK readers really enjoy seeing the fantastic craft ideas from the USA! How great! Thanks for linking to Things I’ve Done Thursdays. Great Banner! I love the bat tree too! Great idea painting the branches white! Love the printable! Thanks for linking up with DIY under $5! Your Halloween decorations look awesome! I haven’t started yet! Thank you for sharing at Simply Creations Link Party! Great printable! Thanks for linking up to the Creative Genius Link Party! Hope to see you next week! I love your mantle! So many cute things, but I love the spooky books and your bat tree! Such fun decor for your home. Great ideas and tutorial for Halloween! i love it, thanks for sharing.